The FIFA Puskás Award [ˈpuʃkaːʃ] is an award established on 20 October 2009 by the Fédération Internationale de Football Association (FIFA), at the behest of then-president Sepp Blatter, in order to award the player, male or female, judged to have scored the most aesthetically significant, or "most beautiful", goal of the calendar year. The award is in honor of Ferenc Puskás, the striker of Real Madrid at the late 1950s and the 1960s, and central member of the highly successful Hungarian side of the same era. Puskás is widely considered by many to be the most powerful and prolific forward European football produced in first-division football, and scored a once world record of 84 goals in 85 internationals. He is one of the top scorers of the 20th century, with 512 goals in 528 matches. "It is important to preserve the memory of those footballing greats who have left their mark on our history. Ferenc Puskás was not only a player with immense talent who won many honours, but also a remarkable man. FIFA is therefore delighted to pay tribute to him by dedicating this award to his memory," said Blatter at the inauguration of the award in Budapest. The time-frame for the first award was July 2008 to July 2009. The annual award was presented for the first time during the 2009 FIFA World Player of the Year Gala on 21 December in Switzerland, with the Portuguese player Cristiano Ronaldo being the first (1st) prize winner. It should be a beautiful goal (subjective — the spread of goals should include long-range shots, team goals, overhead kicks, individual plays, etc.). It should be awarded "without distinction of championship, gender or nationality". It should not be the result of luck, mistakes, deflection by another player or the player in a offside position. It should support fair play, i.e. the player should not have behaved badly in the game or have been charged with doping, for example. Scores and results list the player's club goal tally first. Cristiano Ronaldo's 40-yard strike, earned him the inaugural FIFA Puskás Award. He later went on to call it the best goal he had ever scored. Neymar at the 2011 FIFA Club World Cup. The youngest FIFA Puskás Award winner. Zlatan Ibrahimović's 35-yard overhead kick with his back to goal, won him praise from players and pundits, with the BBC describing it as a goal that "combined unfathomable imagination and expert technique". The following list includes the nominees for the 2013 award. Voting was possible through the FIFA.com website until 9 December 2013, after a second voting round was held between the top three goals from the first round. The award to the winning goal from the second round was presented on 13 January 2014. James Rodriguez's volley was described as "one of the greatest goals the World Cup has ever seen" by Uruguayan manager Óscar Tabárez, who also called James "the best player in the World Cup." The nominees for 2014 were announced on 12 November. FIFA announced the list of 10 nominees on 12 November 2015. FIFA announced the list of 10 nominees on 21 November 2016. Olivier Giroud's backheeled "scorpion kick" volley was described by then-Arsenal manager Arsène Wenger as the greatest he had seen at the Emirates Stadium. FIFA announced the list of 10 nominees on 22 September 2017. 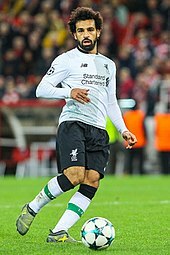 Mohamed Salah was handed 2018's FIFA Puskás Award for a cracking left-footer swirl against Everton F.C.￼ in the Merseyside Derby. FIFA announced the list of 10 nominees on 3 September 2018. Lionel Messi has been nominated a record 6 times, more than any other in the award's history. ^ "Rules Of Allocation" (PDF). Retrieved 12 January 2015. 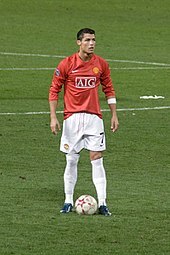 ^ "Ronaldo stunner thrills Ferguson". BBC Sport. 15 April 2009. Archived from the original on 17 April 2009. Retrieved 15 April 2009. ^ "FIFA Puskás Award 2012 – Results" (PDF). FIFA. Archived from the original (PDF) on 23 January 2013. Retrieved 4 February 2013. ^ "Zlatan Ibrahimovic goal like 'a video game', says Sweden coach". BBC Sport. 14 November 2012. Retrieved 15 November 2012. ^ "FIFA Puskás Award 2013 – Results" (PDF). FIFA. Archived from the original (PDF) on 14 January 2014. Retrieved 11 January 2014. ^ "Colombia's James Rodríguez sizzles to end Uruguay World Cup saga". The Guardian. 29 June 2014. Retrieved 30 June 2014. ^ "FIFA Puskás Award: Ten best goals of the year announced". FIFA.com. 12 November 2014. Retrieved 13 November 2014. ^ "FIFA Puskás award 2014 – results" (PDF). FIFA.com. Fédération Internationale de Football Association. 12 January 2015. Retrieved 12 January 2015. ^ "FIFA Puskás Award 2015 Nominees". FIFA.com. 12 November 2015. Retrieved 14 November 2015. ^ "FIFA Puskás award 2015 – results" (PDF). FIFA.com. Fédération Internationale de Football Association. 11 January 2016. Retrieved 11 January 2016. ^ "FIFA Puskás Award 2016 Nominees". FIFA.com. Retrieved 21 November 2016. ^ "FIFA Puskás award 2016 – results" (PDF). FIFA.com. Fédération Internationale de Football Association. 10 January 2017. Retrieved 10 January 2017. ^ "Arsene Wenger hails Olivier Giroud's scorpion kick as the greatest goal he has ever seen at the Emirates Stadium". Daily Mail. 1 January 2017. ^ "FIFA Puskás Award 2017 Nominees". FIFA.com. Retrieved 22 September 2018. ^ "FIFA Puskás Award 2018 Nominees". FIFA.com. Retrieved 3 September 2018. ^ "FIFA Football Awards 2018 – Voting Results" (PDF). FIFA.com. Fédération Internationale de Football Association (FIFA). Retrieved 28 September 2018. ^ "The 10 candidates for the 2018 Puskas award - MARCA in English". MARCA in English. Retrieved 2018-09-03. ^ "FC Barcelona's Neymar Jr and Leo Messi, up for the 2016 Puskas Award | FC Barcelona". FC Barcelona. Retrieved 21 November 2016.